A study of the believers in the book of Acts reveals that after they were filled with the Holy Spirit, they spoke with boldness about Christ (were given the power to witness), they overcame great obstacles and difficulties and they worked miracles of healing and deliverance. Jesus Christ wants to fill you with His Holy Spirit so that His power can be released in and through your life as the Father has promised to all believers (Joel 2:28-29 and Acts 2:16-18). The Holy Spirit will lead and guide you to a full, purposeful, and rewarding life in Jesus Christ. When you receive the baptism of the Holy Spirit, all the blessings and gifts of the Holy Spirit are available to you (Galatians 5:22-23; 1 Corinthians 12:1-7). 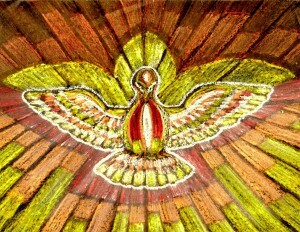 It is the Holy Spirit who empowers you to be a witness with signs following (Mark 16:20; Acts 1:8; John 14:12; 16:8, 13-15). “And I will pray the Father, and he will give you another Helper, that He may abide with you forever, even the Spirit of truth, whom the world cannot receive, because it neither sees Him nor knows him; but you know Him, for He dwells with you and will be in you” (John 14: 16-17). If you have never accepted Jesus Christ as your Lord and Savior, the first step is to repent and renounce any involvement you may have had with the occult, fortune-telling and/or horoscopes. The next step is to forgive those who have wronged you. Then call upon the Lord to save you and forgive you (Romans 10:13; 1 John 1:9; John 1:12). There is great joy in heaven over your decision at the moment you call upon the Lord (Luke 15:7). The Spirit filled life is available to all who are thirsty for the rivers of living water. In Luke 11:13, Jesus also says the Father will give you the Holy Spirit if you ask Him. By faith, believe Jesus at His Word. Receive by thanking Him (an act of faith) for honoring your desire, even if you do not sense any immediate change. It is important to maintain an attitude of thankfulness and worship to the Lord in order to receive His promised blessing. Speaking in tongues was the first physical manifestation of the Holy Spirit baptism throughout the book of Acts (Acts 2:4; 10:46; 19:6). Once you have received the baptism of the Holy Spirit, ask God to anoint you. Wait on the Lord in praise and worship as you spend time in His presence. The witness of the tongues will come forth. It may come as the sound of a new baby with syllables but the language will come. Say out of your mouth what you hear in your belly (in your inner-man). Expect to receive and you will. God wants us to be able to communicate with Him, hear His voice, learn more about Him, do His Will and be baptized with His Spirit. The Holy Spirit will help us conform to the image of Christ to be able to do God’s Will. The Holy Spirit will help you understand the Bible, teach you the truth, and help you to pray. One of the principles in God’s Word is being in agreement with Him and with another person when you pray. Be encouraged to ask another believer to pray with you. Offer praise and thanksgiving to God for baptizing you with His precious Holy Spirit. As you are praising God, thank Him for meeting your needs, such as salvation and healing for your family and relatives. Thank Him for your many blessings. Thank Him for all things and in all things (Ephesians 5:20; 1 Thessalonians 5:18). Get connected to a group of other believers at a local church who are Spirit filled and worship with them so you can grow in understanding, wisdom and knowledge. You will begin to experience greater joy in your walk with God.